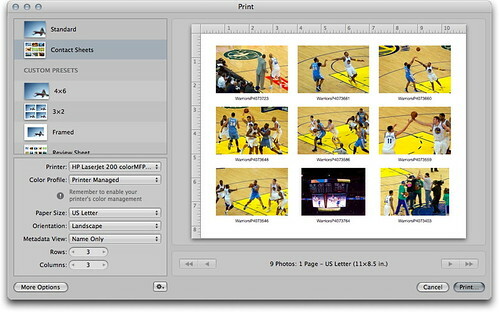 You can create inkjet contact sheets with Aperture by following four basic steps. These are useful as proof sheets for client review, or as a handy way to tell a story with multiple images. There are a variety of options for adding text to the pages too. Here's how. 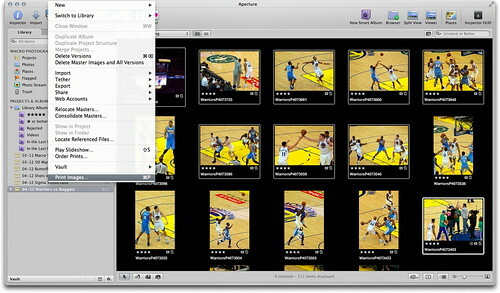 In Aperture's thumbnail mode, select the images you want to add to the contact sheet. Just CMD-click on the shots to choose them. 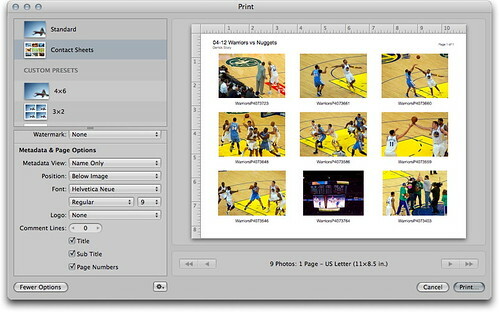 Then go to File > Print Images. In the following dialog box, select the number of rows and columns you want. The fewer you choose, the larger the images. Don't forget to choose your printer and paper size also! Then click on the "More Options" button in the lower left corner to reveal the Metadata panel. Here you can choose the type of information you want on your contact sheet, such as title, file name, etc. The text itself is pulled from the metadata associated with the picture.This includes EXIF, such as the file name and date of capture, and IPTC, such as the caption information and title you may have entered. Now, click Print. You'll be presented with one more dialog box, this one is part of the print driver software. Make your selections and click Print. In just a few minutes, your contact sheet will emerge from the printer. If you want to make a preset of your contact sheet, click on the little gear menu at the bottom of the dialog box in Step 3. Choose "Duplicate Preset" from the popup menu. Give your preset a descriptive name by clicking on it. The next time you want to print this type of contact sheet, just choose your preset. 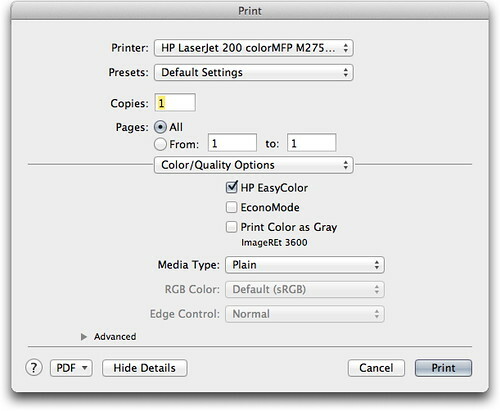 If you'd rather generate a PDF instead of paper output, click on the PDF button in the lower left corner of the Print dialog box in Step 4. Choose "Save as PDF." This is one of those features which has been in Aperture for a long time but is often forgotten. Great post!